An intensive, three-day brainstorming exercise at Wright State University boosted the confidence of students, who came up with potential solutions to real-world problems in the handling of battlefield injuries and mass-casualty situations. The first-ever Innovation Weekend — hosted by the College of Science and Mathematics (CoSM) — attracted about 35 students from four different colleges to the Student Success Center in April. Douglas Leaman, dean of the college and lead organizer, called it a huge success that was made possible by the involvement of regional companies, military and nonprofit organizations. The challenge posed to the students was how to improve the medical monitoring and documentation of patients from the point of injury through all of the transport points until arrival at the final hospital destination. After nearly 48 hours of work, six teams of students presented solutions to an outside panel of experts. Hosted by the College of Science and Mathematics, Innovation Weekend brought students from four colleges together to devise potential solutions to real-world problems in the handling of battlefield injuries and mass-casualty situations. Innovation Weekend was designed based on a “hackathon” approach to problem-solving that is becoming increasingly common in the private sector. The goal was to encourage and enhance an entrepreneurial and innovative mindset in undergraduate students across diverse majors. It was also designed to foster closer ties with the private sector and expose students to experiences of regional workforce relevance. When soldiers are wounded or injured on the battlefield, their transport can come during a life-or-death situation and involve multiple steps — from the battlefield to a triage center to a helicopter to secondary medical unit to a transport plane to a hospital in a different country to a U.S. Veterans Affairs hospital. At each step along the way, the medical information about the patient must be handed off and logged so that the physicians who ultimately treat the patient have the best information. The current system of paper documentation is inefficient at best. Patient information can be incomplete, difficult to read or be lost altogether. Other challenges include the lack of common standards for documenting or handing off a patient, limited time and personnel, the stresses of flight, limited equipment and medication, noise, low light, confined spaces and fatigue. Similar challenges apply in natural disasters, active shootings or other mass-casualty situations in the United States. The students were presented with the challenge and then went through a “speed-dating” process in which they formed their own problem-solving teams. The next morning, each group presented their initial ideas, and then the teams were reformulated based on which of those ideas the individual students wanted to work on. Next, outside experts in emergency medicine, psychology and problem-solving were brought in to help the students develop and refine their ideas. On the final day the student teams pitched their ideas to a panel of judges from the Air Force, along with experts in emergency room patient care, disaster response and medical data visualization. The winning concept focused on improving data communication — using image and audio enhancement, voice recognition and noise cancellation technology. “In doing so, the doctors at the destination are potentially seeing and diagnosing the patients before they even arrive,” said Leaman. 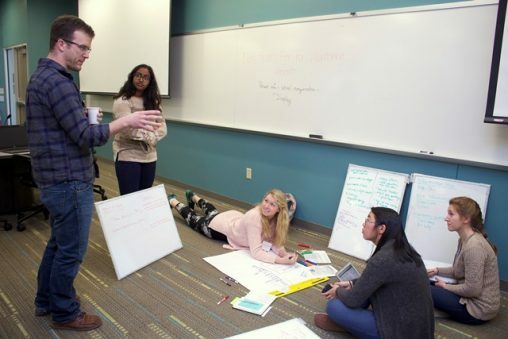 Innovation Weekend was designed based on a “hackathon” approach that encouraged an entrepreneurial and innovative mindset in undergraduate students across diverse majors. Several solutions, including the runner-up concept, focused on replacing paper documentation with digital tablets that feature a patient’s real-time vital signs. One proposal suggested implanting the bodies of soldiers with sensors that detect and transmit information about blood pressure and other vital signs. The three-day exercise was privately funded, as all future Innovation Weekend events will be. 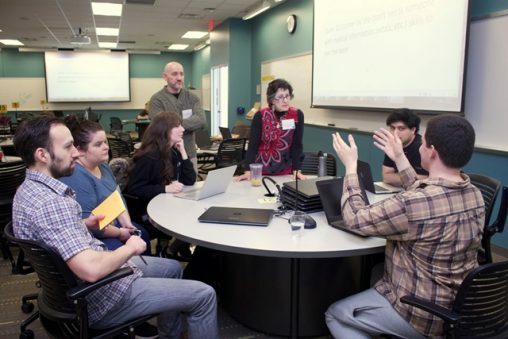 There are plans for four more of these CoSM hackathons at Wright State next year, two in the fall and two in the spring. Leaman hopes future Innovation Weekends will attract even more students and inspire them to get involved in research and internships.